We help companies, artists, PR agencies, brands, and many others in publishing their Wikipedia pages, getting approved by a moderator and keeping them live. Our experts will tailor the wiki page according to your needs, and you can then review, modify and approve the page before it goes live. After your request is accepted, you will be asked to fill out a short questionnaire to provide the necessary details for your page. Once we receive the information, within 3 to 6 days our experts will design a preview copy of your page and send it to you for approval. When you confirm the final draft of your page we will proceed to publishing it on Wikipedia. You will be informed as soon as it's live. The Wiki Pub team consists of wiki editors and moderations who edited on Wikipedia.org since 2006. We review each application thoroghly, and if you are accepted, we will ensure that all Wikipedia guidelines are met and that your article is published in accordance to them. When combined together, our editors have over 550,000+ edits and 3,200+ articles created over the last 11 years. Our editing services are perfect for PR agencies, brand management, company branding, and is among the top PR services available to brand yourself. We have created pages on Wikipedia for corporations, top executives, government agencies, celebrities, non-profits, attorneys, athletes, musicians, filmmakers, authors, and many others. We never disclose our customers to protect their privacy and anonymity. A Wikipedia page is the ultimate achievement your business can obtain. Here are a few reasons & benefits to illustrate that. Wikipedia is the world's top authority site. If your company is listed on Wikipedia it means that it is important and trusted. Google ranks Wikipedia pages top 1 for almost anything. Having a Wikipedia page will boost your authority and ranking. We will place a direct link to your company website from the Wikipedia page to achieve best SEO results. With some of our customers we have seen 300% increase in organic and referral traffic after obtaining a wiki page. 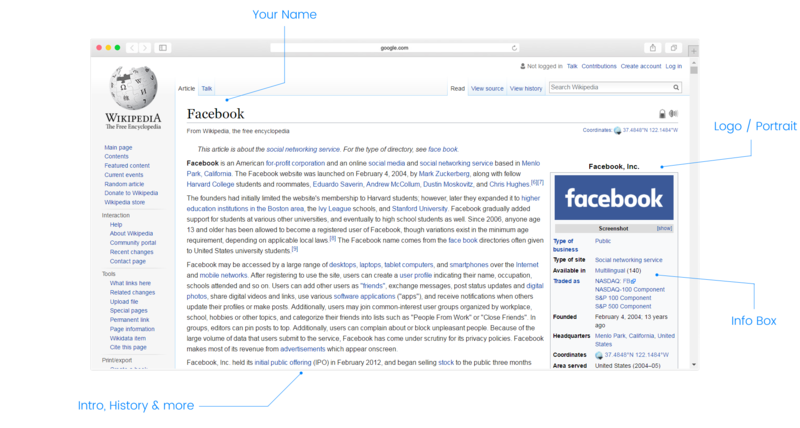 Having a Wikipedia page is crucial for anyone who wants to have the knowledge graph on the right side of Google results. By creating your Wikipedia page with us you will ensure that your company is represented exactly the way you want. Based on our experience these two packages are suitable for most of our customers. Please choose according to your notability. Payment due after your page is live There is no upfront payment. The fee is due once your Wikipedia page is published and live. We have Senior Editors and Moderators who can instantly approve your pages! 3 Months Guarantee In the unlikely case that your page is taken by another mod, we will reinstate it. If we can't, you will receive a full refund. Payment due after the posts are live There is no upfront payment. The fee is due once your media coverage is completed. This package will boost your online pressence and solidify your wiki page. We provide our customers with all round Wikipedia services, including translation and publication in other languages. 60 Days Money-Back Guarantee! In the unlikely case that your page is taken down by another mod in the first few weeks of review procedures, we will reinstate it. If we can't, you will receive a full refund - no questions asked! Payment due after the article is live There is no upfront payment. The fee is due once your media coverage is completed. If you need 2 languages you will get 15% off, if 3 or more then 20% off! Due to high demand on Wikipedia pages, our editors are currently overwhelemed with orders and we will only be able to process your request within 3-4 weeks. We apologize for the inconvenience. In the meantime, you may try our Wikipedia links to boost authority of your website, improve SEO, and get your domain named inxeded in the Wikipedia database (which also helps with page approvals down the road). Wikipedia links are used to build website authority, drive relevant traffic, boost SEO, and get your web domain inxeded in Wikipedia for easier page approval down the road. What will my link look like? Click here to see an example. Don’t take our word. See what our clients are saying about us. This was an important task for our airline, and the wiki pub team handled it with extreme professionalism and great support. We have already noticed an increase in business. I would like to thank you on behalf of my company for delivering exactly what you promised! We are extremely pleased with the Wikipedia page that you guys published. Thank you for your work, we will recommend you to everyone. Do you work with any business or person? No, we do not accept every application. Only notable individuals and companies are elegible for a Wikipedia page. We review each application carefully and tell you whether it is possible to have your page published or not. In case if you don't have much media presence, we can help with that. The difference is that the first package is the actual Wikipedia publication. While the second package offers authority media coverage on sites like the Huffinton Post, World News, Esclair Magazine, Buzzfeed, etc. Our clients often combine both, to boost their online presence and to have a stronger Wikipedia submission. How long will it take to get the page? It depends on each case. We generally deliver pages within 2 weeks or less. However, in some cases it may take up to 3 weeks. Please rest assured that we always aim to deliver at the fastest speed without compromizing the quality of our work and the safety of your page. We rather deliver a week later but ensure that the page sticks, than the other way around. The beauty of our service is that you pay $0 upfront. Simply submit the form, and we'll get started on your page. The payment is due only once your page is published and live. Please note however, that if you refuse to pay us after we publish and deliver your page, we will remove it from Wikipedia within 48 hours. 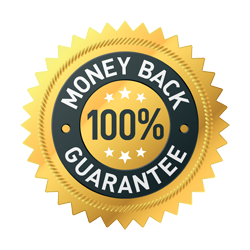 Yes we do offer a replacement and money back guarantee. In case if anything happens to your page and it is reported to us within 3 months of its creation, we will reinstate the page free of charge. If we fail to reinstate the page, we will refund your payment according to our refund policy. No there are no ongoing fees. You only make a one-time payment for the packages above. Once we publish and deliver your page, it will remain on Wikipedia free of charge. However, in case if you wish to make any changes in the future, we will charge a separate fee. Yes we will, but you are also welcome to send us any content you wish to be added to your page. In case if you're not sure what to include, we will provide a questionnaire to fill out, and then prepare your page according to that information. Please note that any content you provide is subject to change, as we have to ensure that it complies with all Wikipedia policies. Yes we are happy to offer bulk discounts and cooperate with resellers. We provide our services to several SEO companies who are very successful in selling it to their clients. In case if you aren't intersted in reselling, and simply need two or more pages for your business, we may offer you a special discount as well. Please fill out the form below to submit your application. We will do our best to get back to you within 24 hours. All information & inqueries are 100% confidential. The Wiki Pub - Copyright © 2019.